This is an article about my homepage setup. This is how I generally browse the web whenever I log on. Over the years, I’ve tried to make things more efficient. I spend a lot of time in front of the computer, so I’ve found a bunch of tips and tricks which makes life simpler. If you’re interested in improving your browsing habits, then great – please read on. If not, oh well – it’s no loss to me but it may be to you. There’s a few things which I install with every browser to optimize general efficiency in surfing habits. Probably the most important, and one that’s bound to save you a ton of reading time and eye-strain is a Firefox extension called Adblock Plus. If you don’t have it, install it – immediately. There’s nothing better than blocking all the advertisements which people are trying to inundate and brainwash you with. That is the first and foremost thing anyone with any shred of decency and self-respect should do with Firefox. Recently, I encountered an error with my personalized homepage which predates the Firefox-era. 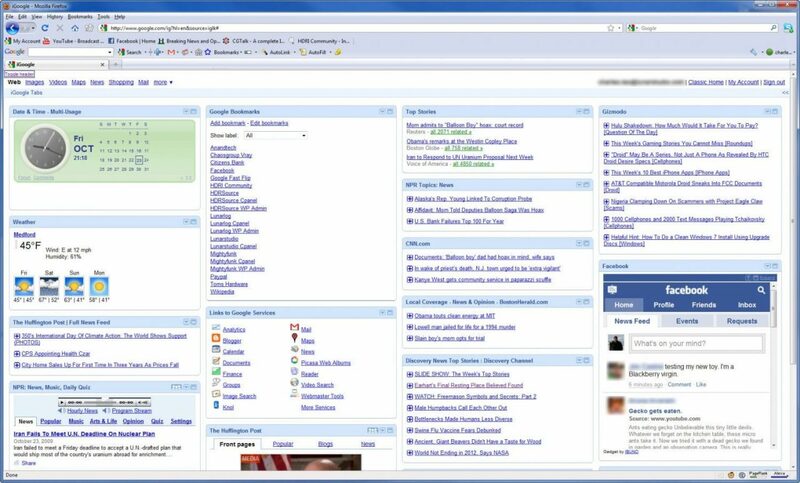 This homepage dated back to a time when Internet Explorer was my main browser of choice. 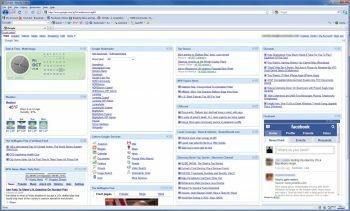 I used to have a customized version of www.msn.com which when ‘signed in’ to MSN Live services, had all of my personal bookmarks, news feeds, weather, and other miscellaneous articles. At first glance, I was apprehensive of this page, but over time I actually came to rely on it. All my important information and headlines was available there at my fingertips. It cut down on the amount of time I spent surfing the web – and allowed me to quickly glance at what was transpiring around the globe within a matter of seconds. But over the course of the last couple of days my.msn.com suddenly stopped working. I supposed that this was done on purpose due to the timing of the Windows 7 release. Of course, one cannot be entirely certain. I tried to look up the outage online, but didn’t turn up any results. On the other hand, the homepage still works on Internet Explorer – however, I refuse to use IE other than to test my website designs across people’s screens. So this ‘glitch’ went on for over a day. Then two days passed. I quickly realized that Microsoft probably wasn’t going to ‘fix’ this anytime soon. I needed a fix – something similar to my old homepage. I knew Google had their own customized version called iGoogle which was similar – however the layout is quite garish and ill-conceived. So just for kicks tonight, I decided to give it another try and see what I could do in order to make it read just as efficiently – and perhaps even better than what the old MSN homepage of mine provided. I found that with a couple simple tricks, that I was able to do away with my old homepage and come up with something leaps better while doing away with their poor (current) design. 1) The first thing to do is to log in or sign up for Google in order to access this page if you don’t already have one. Signing up for Google gives an end-user access to a whole suite of useful tools and preferences. Check the upper-right hand corner of your browser window for the sign in page. 2) Once you have an account, log in/sign in to Google and head over to the iGoogle page. 3) You’ll notice that the main header and banner at the top of screen takes up a tremendous amount of unnecessary screen real-estate. In the middle is a huge Google search box – this is redundant space for me as I use the Google Toolbar (mostly to check website search optimization and Pagerank.) If you have a monitor that has a resolution above 1900 wide, any personalized graphics you have in there also gets cut-off which makes it look even worse. There’s a simple solution for this – remove it entirely. And no, the Google devs do not want to make life easier for you (I don’t think it’s intentional), so you have to find a workaround. 4) You may want to customize your actual page now. In the upper-right hand corner of your iGoogle homepage is a button which reads ‘Add Stuff>>.’ Click that and you can add various items to your homepage. I include the weather forecast, calendar and time, my abbreviated Facebook feed, the NPR Radio, my personal bookmarks, the news I like to read, articles, and gadget-related websites. I’m still not finished – I may add a Google Voice so I can text message people for free. Have fun adding what you like. At the beginning of this article, I included a screenshot of my browser window after having made all of these changes. Keep in mind, I have a 24″ monitor set to 1900 pixels wide for graphics works- so you may have to scroll through the image in order to see the full page. And that should be about it. Any time you want to add additional content to the page, just disable the ‘iGoogle Tab Remover’ – Upper toolbar: ToolsDisable iGoogle Tab Remover and reload your page. Enable it again when you think you’re all set.